WHAT do most couples do on the morning of their wedding day? Have a relaxing bath? Get pampered? Maybe sip a little glass of bubbly? Not so for Liam Royle and bride-to-be Laura Sturgeon. For the sporty couple chose to take part in their favourite pastime - the Pomphrey Hill Parkrun. 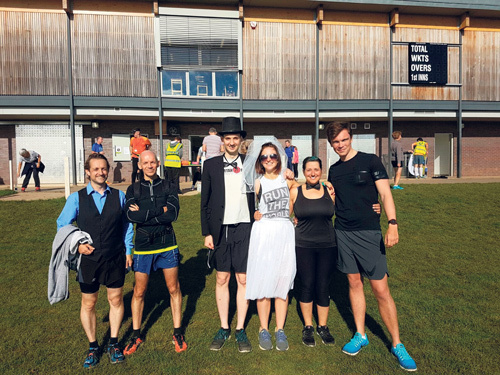 Liam turned up for the 5k run at 8.45am wearing a jacket, top hat and bow tie. Not to be outdone, Laura donned a tutu and veil for the run, which was well attended by family and friends wanting to wish the couple well. As Laura had hurt her foot, the pair volunteered as time keeper and tail runner. Laura, 31, received huge support from her pals at Bristol Vegan Runners who turned up in force to give their support. The couple, who live in Kingswood, started attending the parkrun shortly after meeting two years ago. "It was Laura's idea," said Liam, 26. "She just said 'Would you like do the parkrun on our wedding day? We can get dressed up and run together'. I thought it was a really nice idea." The couple left Pomphrey Hill around 10am - with plenty of time to spare to get ready for their wedding at 3pm at the Battleaxes in Wraxall. "We scheduled a late ceremony so we could fit the run in!" said Liam. "It was a really nice day and everyone was so supportive. So many people caught us going round to wish us luck for the afternoon.
" Running together is really important to us so it was really lovely and a nice way to start the day." The couple, who tied the knot on September 17, are now looking forward to their honeymoon in Costa Rica in January.